For those of you who know me, you know how much I hated Twitter. It felt like such a pointless thing. Did I really care what my friends were up to 24/7? "Bob: I just woke up." "Bob: The weather is so nice!" Although the company started out as a way for people to let their friends know what they were up to, Twitter users have taken it into a whole different direction (in a good way of course). You still have those users who think it's important to let everyone know what they're doing all the time, like our friend Bob up there. Then there are other users who use Twitter to relay information (i.e. breaking news stories, marketing, etc.). Being a blogger, I'm going to be focusing on the usefulness of Twitter in the blogging world. The simplest way I can describe Twitter to you is this: Think of it as the status update portion of Facebook. If the only thing you were allowed to do on Facebook was to update your status, and nothing else, you would have Twitter. It is also a means to share and receive information with millions of people across the globe, at the same time. It's a place to connect with people, celebrities, sports players, businesses, and more! I have NetworkedBlogs, Facebook, RSS Feeds, etc. Do I really need Twitter too? YES! The number one thing any Blogger needs is an audience. The more platforms of exposure you have for your blog, the better. Twitter is a great way to let people know whenever you have new posts. Your readers can follow you (subscribe) on Twitter and can even choose to get your tweets on their mobile phone. They can also "retweet" your post and share it with their followers, giving you an even bigger audience. "Retweet" my posts? You lost me there! Anytime you tweet (post) something, anyone who sees your tweet can retweet (repost) what you said. Basically they can share your post with their friends/followers by reposting it. There are two ways to retweet a post: copying and pasting what the person said and putting "RT" before the tweet; or using the retweet button provided by Twitter. I will give an example of the manual (copy/paste) retweeting because the latter is done automatically by Twitter. In the above example, Bob shared with his followers that he has a new blog post and he provided the link. Bill, who is following Bob, liked the post so he retweeted what Bob said. Now Bill's followers will see Bob's blog post and if they like it, they in turn will retweet it as well. Do you see the picture here? If you are a blogger and don't have a Twitter account yet, I suggest you take a moment to open up a new browser tab and sign up. Why am I seeing tweets with the # symbol? The # symbol, or better known as hashtags, is a way to tag your tweets. Think of it as Labels (if you use Blogger), or Categories (if you use Word Press). It's a way for people to easily find tweets related to a certain topic or a major event that's going on around the world. One of the most common ones you will see every Friday is #FF or #FollowFriday. This is a great thing that started on Twitter where each Friday Twitter users will mention various people they follow and put one of the two follow friday hashtags in their tweet. It can provide exposure to your account and can increase your follower base. Now anyone who searches on twitter for #friendship, will come across his tweet. Of course all of this applies to public tweets. There are also specific hashtags, like the follow friday ones, that are used during particular events. For example, during the Presidential Inauguration if your tweet was about the event, the hashtag to use was #inaug09. During the Iranian elections, people were using the hashtag #iranelection. 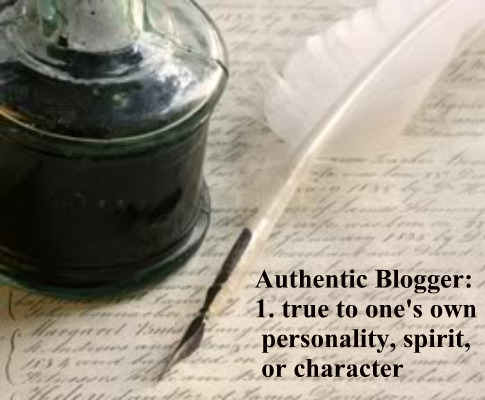 For Authentic Blogger, a wonderful group of bloggers I belong to, we have decided to use the hashtag #ABauthor with our tweets. Be sure to search for the #ABauthor hashtag on Twitter to be kept up to date with new blog posts by Authentic Blogger members. Although Twitter allows users to make their accounts private, I think it should be done away with. All of the above that I said doesn't apply to you if your account is private. By protecting your tweets, especially as a Blogger, you are limiting your audience, and as I mentioned earlier the number one thing we want is exposure. No one will mention your profile on Follow Friday because people aren't going to be able to easily follow you. In fact, most people tend to stay away from private accounts. It become more difficult to retweet your posts because you made your account private. Your followers don't know if it's okay to retweet what you said, even if it's a link to your new blog post, putting them in an awkward place. When you use hashtags in your tweets, they won't show up when people search because your tweets are private. Twitter is not like Facebook where you want to know who people are before you approve them. You share far more on Facebook than you do on Twitter, so naturally most people make their Facebook accounts private. There's nothing to hide on Twitter, it's just your updates. There are no photo albums, wall posts, etc. It is the most public forum you will ever come across and it's best to make your account public. If you are afraid of spammers following you, it's not that big of a deal. You just look over the list of people following you and when you come across a spammer, just report the account as spam and it will remove and block that person from your profile. For those of you who are part of the tweeting world, keep on tweeting and sharing your new posts. For those of you who aren't too fond of Twitter, and might even hate it like I once did, I hope this helped to change your perspective by seeing the usefulness of it for your blog. Remember that a blog needs an audience like peanut butter needs jelly! We think Anahid did a great job w/ the post too, and we plan to have her do more guest posts. She has such a strong knack of taking technical details and making them understandable and user friendly! This is a great post! I do have a few Twitter posts on my blog, but I never posted from the point of view of using it for your blog, so this is quite useful. Twitter is so cool, and it's sad to think that some people are *still* of the mindset that Twitter is nothing but "I just had breakfast" posts. One disagreement, though. I don't think making accounts private should be "done away with," but I do agree that it's kind of pointless if you're trying to use Twitter to help get your blog out there. People who don't blog, I can certainly understand (though I don't share the feeling) them wanting to keep their tweets to a select few. Dave, I am of the same mixed opinion on the Privacy feature as you are. I see the logic in going Public, per Anahid's suggestions, and I did that yesterday. Since then, I can report that I have been hit with 7 spam Twitter followers that I've reported and had blocked. That doesn't happen if you stick w/ the Privacy feature toggled to ON, but thankfully, Twitter has things set up where it just takes one click to block/report as spam/delete as follower. So, all in all, I'll stick w/ the Public format for now. It is a continual learning process, this social media stuff, and it will only continue to grow and expand. Makes my head hurt just thinking about it! Boy, was THIS ever helpful!!! Molly, we agree w/ you - Anahid wrote a really savvy, helpful, informative and user friendly article. We'll be asking her to guest post again in the future! Thankyou so much for this post it helped alot...I have a question regarding your badge....where can I go to make one...I have looked all over but to no avail...help! Just came across your blog and this post. I'm not using Twitter as often as I should, but I do see the virtue in its use. Thank you Anahid for a useful post. I think I finally understand what's good about Twitter. Isn't there some kind of search function, too? Nice!!! I didn't know that about the hashtags. Off to Twitter I go. I was just blogging about twitter this weekend. I needed a guide and you definitely answered the call. Thank you! Thank you...very well written and easy to understand! Continue guys with your great AB Blog! Thanks for the post on Twitter it is very important that people start using the social media to connect with their fans and twitter and facebook both give ample opportunity for that. Like you said, twitter gives the advantage of having more people spread the word about your blogs and your pages by retweeting your post. It s vital nowadays.